The race for the 2016 Republican presidential nomination has turned into quite a battle, so it’s appropriate that a week from Tuesday, the GOP campaign heads to the Battle Born state for Nevada’s first-in-the-West caucus. Sen. Marco Rubio of Florida took the first real beating of primary season last week in New Hampshire. Rhetorical punches delivered by New Jersey Gov. Chris Christie during a debate led to a fifth-place finish for Sen. Rubio on Feb. 9 (as well as the end of Gov. Christie’s campaign). However, after emerging from Saturday’s knockdown, drag-out South Carolina debate with the performance of the night, Sen. Rubio quickly got himself back into the front-runner conversation with businessman Donald Trump and Sen. Ted Cruz. On Feb. 5, the Review-Journal editorial board endorsed Sen. Rubio for Nevada’s Feb. 23 GOP caucus, and his Saturday debate performance reaffirmed many of our reasons for doing so. The Florida senator opened with a stout defense of the Constitution and Supreme Court Justice Antonin Scalia, who died Saturday. Additionally, Sen. Rubio deftly handled a multi-part foreign policy question from CBS moderator John Dickerson, getting out of the robotic talking-point mode that derailed him in New Hampshire. The debate rose to a fever pitch when Mr. Trump tore into former Florida Gov. Jeb Bush — and the presidency of his brother, George W. Bush — and Sen. Rubio stepped into the line of fire: “I just want to say, at least on behalf of me and my family, I thank God all the time that it was George W. Bush in the White House on 9/11 and not Al Gore.” And when Sen. Rubio was lobbed a softball question on past presidents, he did what he was supposed to do — he hit a home run, tying today’s America to the country’s status at this same point in 1980, when Ronald Reagan was making his charge for the White House. There was a lot of scorched earth Saturday, some of it quite discomforting, which goes back to a critical issue we noted in endorsing Sen. Rubio: electability. While being able to take and deliver punches in GOP debates is important, it hardly matters if the nominee doesn’t win come November. In a Feb. 8 survey from Public Policy Polling, Sen. Rubio leads both Hillary Clinton and Sen. Bernie Sanders in head-to-head matchups; Mr. Trump, Sen. Cruz and Gov. Bush all not only trail Mrs. Clinton, but avowed socialist Sen. Sanders, as well. Sen. Rubio’s story speaks to Nevadans. He lived in the Las Vegas Valley from age 8 to age 14, the son of immigrants employed by the hotel industry, and he understands the issues facing Nevada — federal lands policy, immigration, and the need for reform on tax policy, entitlements and the regulatory state. Efforts to tag him an establishment candidate or a RINO (Republican In Name Only) fall flat when examining his superior ratings with leading conservative organizations. Sen. Rubio has worthy peers in the GOP race who could prove formidable in November. But he remains the best-positioned GOP candidate to win the White House on Nov. 8. 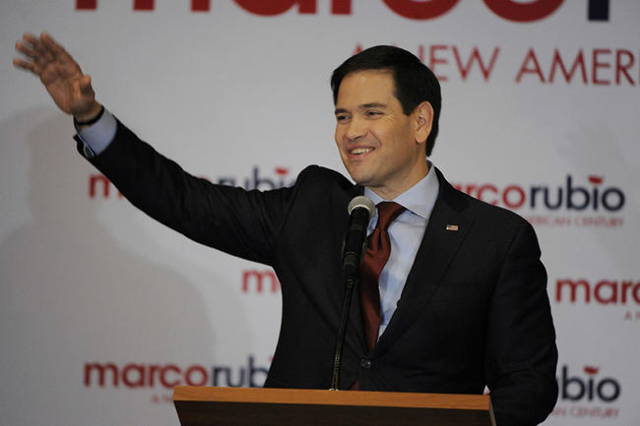 Nevada Republicans should plan to caucus Feb. 23 and pledge their support to Florida Sen. Marco Rubio.